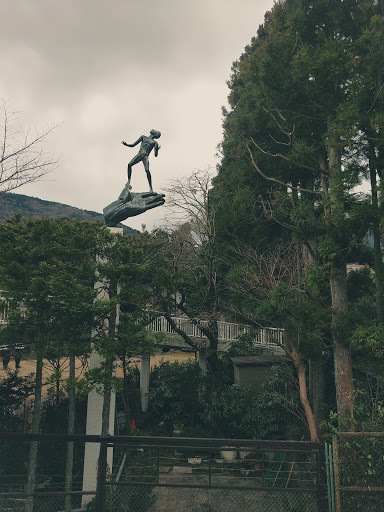 It was time for our day trip to Hakone. 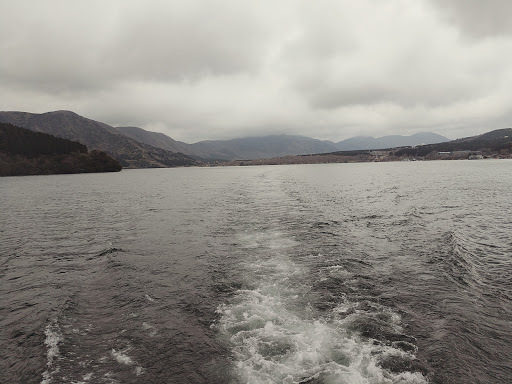 Hakone is a ‘geopark’ known for its natural springs and stunning scenery. It is also known as a great spot to see Mt Fuji from. On our last trip to Japan we had considered both Hakone and Kamakura as trips from Tokyo and in the end decided to go to Kamakura. 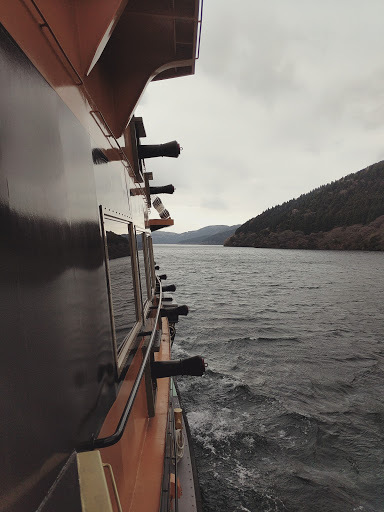 This year it was time to finally head to Hakone! 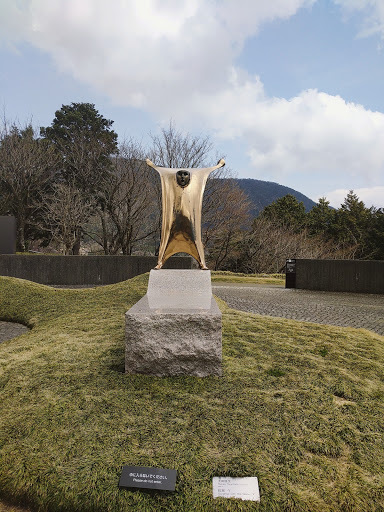 To make our journey as economical as possible we had purchased the Hakone free pass, which provides unlimited use of buses, trains, ropeways, boats and cable cars in the Hakone area as well as a discounted trip from Shinjuku station. It’s available as either a 2 or 3 day pass, we went for the 2 day which cost 5140 yen each. Whilst waiting for the train we discovered the Hokuo bakery at Shinjuku station, it served the yummiest pastries and they were super perfect for scoffing on the platform. In some trains in Japan eating is frowned upon so we didn’t want to get onto the train hungry. We were up pretty early, catching an 8am train to Odawara, where we arrived at 9.30am. From Odawara we caught the Tozan railway line to Hakone Yumoto. The Tozan railway is Japan’s only mountain railway and despite being sat on the wrong side of the train, we still saw some beautiful sights. The journey was extremely busy though and the train was jam packed. We got off at the Chokoku No Mori stop, by this time it was about 11am and I felt like we’d been travelling forever. It was nice to finally get some fresh air and be out of the packed carriage. 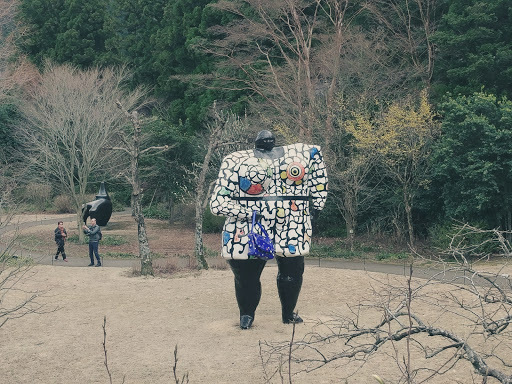 Our reason for the stop was the Hakone Open Air Museum. The museum features an open air space with lots of sculptures as well as an indoor building, featuring work by Picasso. 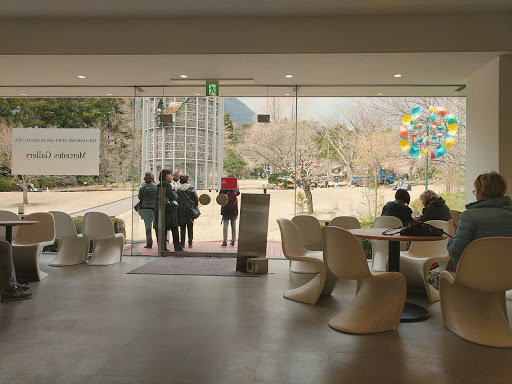 The entry fee was 1400yen which was a discounted rate, as we had the Hakone pass. We ended up spending about an hour wandering around. Unfortunately it was already clear to us that we would not be seeing Mount Fuji today, one of the main reasons people visit the area of Hakone. Having been blessed with beautiful sunshine for our trip so far this day was overcast and grey. There was lots to see at the museum and we easily could have stayed longer, if it was warmer. 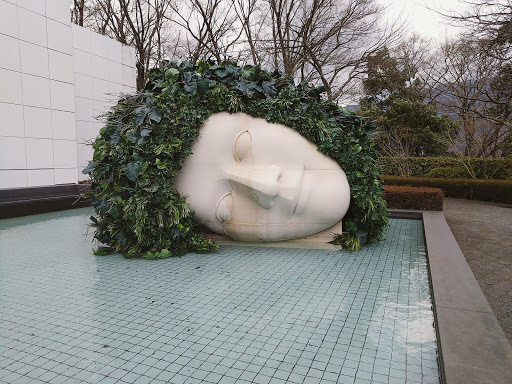 The setting is fantastic, offering views over the mountains, and it’s lovely to weave around the giant sculptures. We jumped back on the railway until the final Gora stop and then transferred to a cablecar to Sounzan Station. 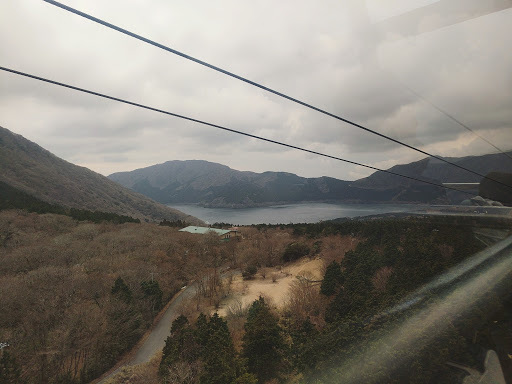 Usually from there you would be able to jump onto a ropeway but signs within the cablecar indicated that it wasn’t running from Sounzan and we jumped onto a replacement bus instead. This took us to Owakudani, a volcanic crater formed 3000 years ago. 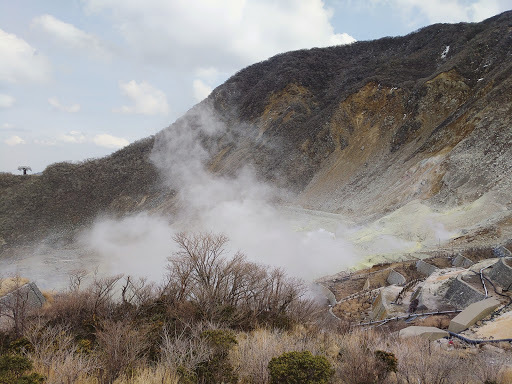 It is still an active volcano zone and sulphurous fumes, hot springs and sizzling rivers can all be seen here. I was expecting the area to smell sulphurous but actually there was no strong smell at all. It was however super windy, I got a bit stressed trying to get a picture/ make sure I didn’t show my entire arse to the whole of Hakone. 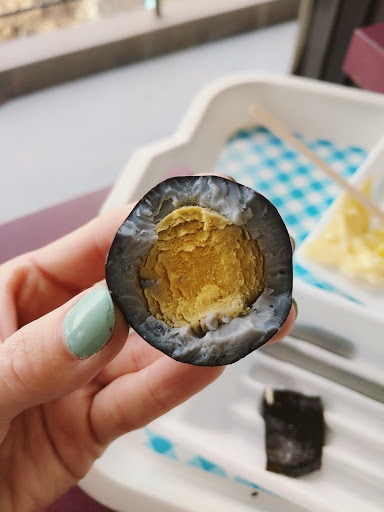 One of the things you can do in the area is try the famous black eggs, cooked within the crater and blackened by the sulphur. Eating one egg is said to extend your life by seven years! There was a stand selling eggs by the entrance but within the gift shop we found some vacuum packed eggs which were already peeled so we decided to go for these to minimise mess. I don’t know if these ones were cooked slightly different as the other black eggs had a black shell but were perfectly normal inside whereas these ones were black through and through. For 2 eggs it was 200yen. Adam wasn’t keen at first, well actually that’s a bit of an understatement as he plainly refused to eat one. I tried one, apprehensively, and discovered it was the most delicious egg ever! They had quite a strong smoked taste which I really liked and encouraged by my positive reaction Adam eventually tried them. He also enjoyed them so we would both recommend! 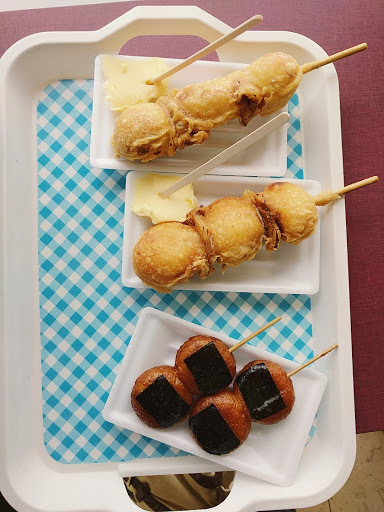 We decided to stop for a proper lunch stop here too, there was a small food court area and we were able to grab some grilled mochi and potato fritters. They were delicious, as most food in Japan is! I think it helped that the potato fritters came with a side of butter, which melted pretty gloriously over everything. Happily full we continued onto Togendai using the ropeway. The views from the ropeway were very pleasant, although once again I’m sure we would have seen more if the clouds had decided to move out of our way. 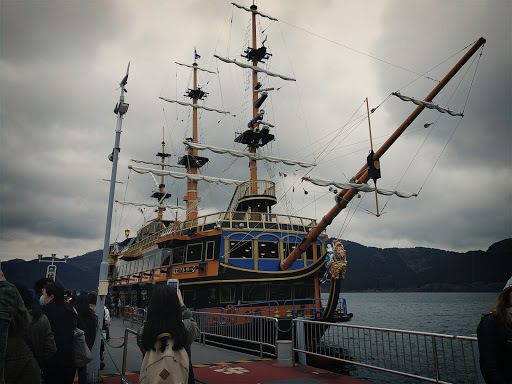 We were then able to catch the sightseeing cruise on the lake Ashi. On a clear day the lake is known for its Fuji views but we could only look out into grey. This was made better though by the impressive ships, based on old sailing warships. The theme continued to the staff, dressed in pirates outfits, and even the lifejackets, being kept in treasure chests. They adore a theme in Japan! After our cruise we got the bus back to Odawara and then the train back to Shinjuku. We were pretty ravenous by the time we arrived back and walked with purpose to try to find somewhere to eat. 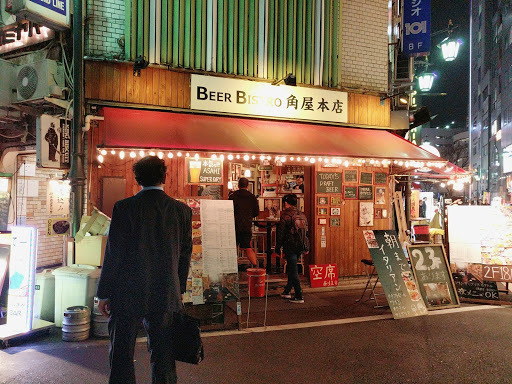 We were encouraged in by a friendly waiter to the ‘Beer Bistro Kadoya Honten’. We hadn’t been anywhere like this before, a tiny restaurant that only seated 8 and was comfy to say the least. It happened to be an Italian restaurant and whilst the combinations of food weren’t exactly what I’d call ‘Italian’ it was absolutely delicious!!! 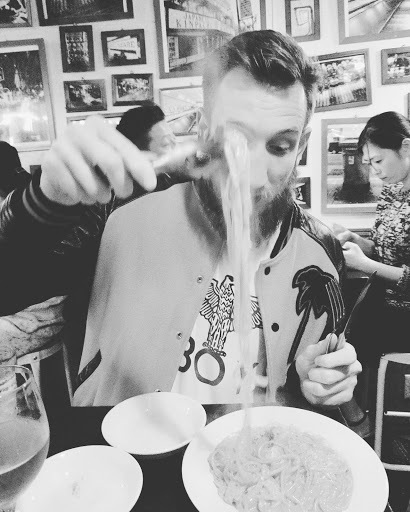 It was one of the best meals of the trip. The service was fast and friendly and it was great value. 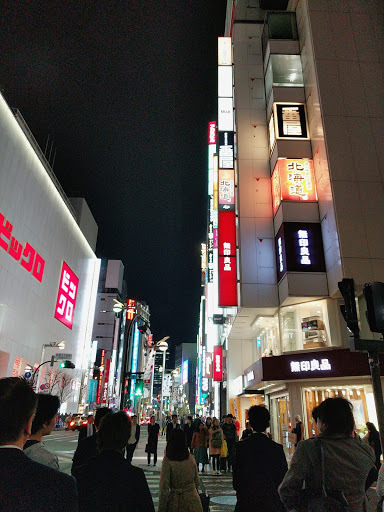 Afterwards we walked through the bright lights of Shinjuku in a bit of a high. taking in the amazing lights that surrounded us, the lively atmosphere despite the late hour and the alcohol consumed with dinner might have had something to do with it too! 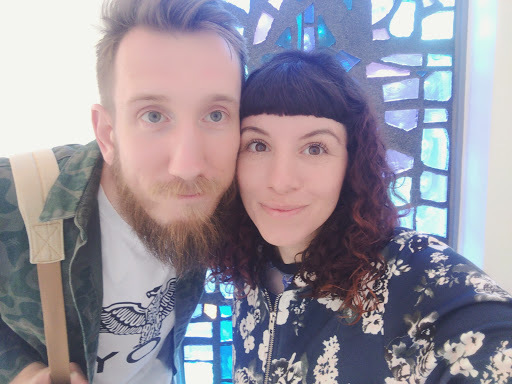 Our apartment was walking distance to Shinjuku and we finally found the time to explore the temple just up the street from us, which we had walked past every morning. 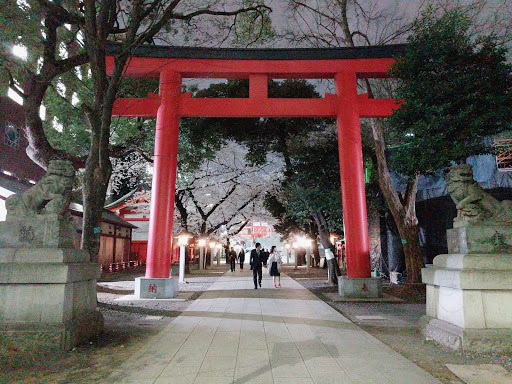 The cherry blossom that surrounded the temple was uplit and absolutely glowed, it was a perfect end to a beautiful night!